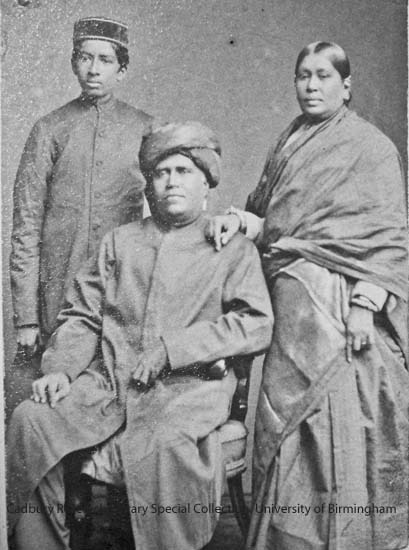 Both Anna Satthianadhan and her husband, the Rev W T Satthianadhan, were honoured when they were presented to Queen Victoria in 1878 – Anna for her work in female education and her husband for pioneering self supporting and self governing churches in South India. By then Anna had proved that her old mentor, Caroline Cuffley Giberne, had been wrong to believe that Indian female teachers would require European supervision to be successful. At the CMS anniversary meetings in 1878 it was reported that Anna’s husband was in charge of an important pastorate in Madras (Chennai). This was at Chintadripet which he renamed the Zion Church1. He went on to take charge of the Southern Pastorate in Madras as well as becoming the chairman of the Madras Native Church Council2. Anna in 1878 was superintending six schools in four different suburbs of Madras with a total of 430 students. Four of these schools were for higher caste Hindu girls and the other two for those from “poorer classes”. In addition she was supervising the classes for 106 young women from upper class Hindu families (including Brahmins) in 56 zenanas. She was supported in this by the Church Missionary Society (CMS), the Society for Promoting Female Education in the East (SPFEE) and the Hindu Female Instruction Society. Lord Shaftesbury signed the Bible which he presented to her on behalf of the SPFEE as a memorial to her first visit to England3. From Miss Giberne Anna had learnt not only how to write well in English but also how to run a good school. And Miss Giberne was one of her role models in how to live a deeply committed Christian life sustained by a personal faith in Jesus Christ. Her other role models were her parents, the Rev John Devasagayam and Muthammal, and her husband. Unlike her he had been forced to decide between his family or Jesus. Below:Miss Giberne’s sketch of Anna when she was 11-years-old. At the CMS anniversary meetings3 he described how, when he was 14-years-old, his high-caste father had sent him to the mission school at Palayamkottai to learn English. So Satthianadhan continued studying there for another three years and recounted: “In the meantime the teacher paid particular attention to the inculcation of Scripture truths and applied them to the hearts and consciences of his students in such a way that they were much impressed by them.” He said that under this admirable teacher the “folly of heathenism” and the “truth of Christianity” dawned upon him. He knew that to convert to Christianity would mean social alienation from his home and his community but finally he made that decision. The conversion of a higher-caste youth created a sensation in the district and emptied the mission school. He became an object of persecution and was dragged before two magistrates, European and Indian. But he was determined to continue as a Christian and was baptised with the names of William Thomas in 1847. He began training for the Anglican ministry and worked with the Rev Devasagayam. He married Anna in 1849 and by 1855, when he went to Doveton College in Madras to complete his studies, they had two daughters, Joanna and Catherine (Kate). After two years of study he gained a gold medal for his examination results. The CMS then sent him to join an evangelistic itinerancy team in North Tirunelveli where the couple became very involved with a Pentecostal revival among schoolgirls in mission schools5. In June 1859 he wrote to Miss Giberne at Kadatchapuram to share the special news that not only had his first son (John) been born but that his youngest brother had become a Christian3. After Miss Giberne had retired to England Anna wrote to her (in May 1863): “You will be surprized to hear that we are now in Madras. Although we did not like to leave our dear people at North Tinnevelly (Tirunelveli) yet we could not but submit to the leadings of Providence.” Her husband, who had been ordained as an Anglican priest in December 1862, had been assigned to care for two churches – one at John Pereira’s (Trinity Chapel), and that at Chintadripet. Once in Chennai his wife began a small school for higher caste girls3. Satthianadhan fervently supported his wife and obviously encouraged her to follow the same pattern of education as his mentor, William Cruikshank. For the curriculum included reciting texts from the Bible from memory as well as Scripture history, reading, Indian geography, and studying the works of an Indian minor poet, Attihicudi. The missionaries and Mrs Satthianadhan were so successful in altering attitudes towards female education in India that by the 1880s they were facing strong competition from Westerners and Indians who were starting girls schools and zenana classes with secular curriculums. Anna trained Biblewomen so that they could visit zenanas to teach in Tamil, Telugu and English and explained: “With the elementary instruction in reading, writing, arithmetic and needlework the study of God’s Word is invariably combined,”10 By the 1880s all of the female teachers in her schools had been trained in the Normal (teacher training) Class at one of them. But earlier she had employed both Christians and non-Christians, including a Muslim woman. She was also assisted by her daughters especially Kate (Mrs Hensman) and Annie (who married the Rev W.D.Clarke). Some Hindus were converted but certainly not as many as the Satthianadhans would have wished. But many Indian women, including those hidden inside zenanas, benefitted significantly by this access to education – none more so than widows. Many were left virtually destitute and as social outcasts after their husbands died because it was believed (as even now11) that they were responsible for those deaths. In 1890 a Hindu woman visited Anna and told her: “Years ago, you may remember seeing me as a little girl…and asking my mother to send me to some Mission School close by. My mother took up the idea at once, and sent me to the London Mission School.” She later became the headmistress of a Hindu girls’ school. This meant that when her husband died leaving her with two young children she could continue to earn a living. But she wanted to escape the social death of Hindu widowhood by becoming a Christian12. It is probably from two of Anna’s daughters-in-law that a clearer picture can be gained of Anna’s legacy and that of Miss Giberne. But in Anna’s son she found a man who would encourage her to achieve intellectual fulfilment. Ill health having stopped her completing her studies she married Samuel and went with him to Ootacamund where he was the headmaster of a school. She became involved in female education and set up a small school for Muslim girls.15 Despite often being ill she wrote poems, travelogues, prose and two novels. Saguna (serialised 1887 and 1888 in the Madras Christian College Magazine) was the first autobiographical novel in English to be written by an Indian woman. She completed her second novel Kamala after being diagnosed with incurable tuberculosis. Krupabai grew up in a family where her father and eldest brother were committed Christians but her mother, although a convert, remained very much a Hindu. And so in Kamala Krupabai was able to describe graphically from the viewpoint of a Hindu how a child-bride suffered in a home dominated by her mother-in-law. She wrote: “What man with any self-respect would make much of his wife, give her learning, and raise her up to his own level? The wife, as the saying went, was the ‘cat under the plate’, the slave of the family and of her lord.” And added later: “She was his wife, his property, and he felt that there was no need for him to exert himself to draw her nearer to himself.” 16 In Krupabai’s story Kamala chose after her husband died to remain a Hindu and became involved in charitable work. It was not surprising that Queen Victoria and many missionary agencies in Britain were so encouraged and inspired by the Satthiandhans for they would have epitomised the empowerment that the Christian gospel and education could bring. Queen Victoria, after receiving a copy of Saguna, asked to be sent any other books that Krupabai had written19. A fitting epitaph to the work of not only Anna Satthianadhan but also Caroline Giberne’s! Below: A photo from Miss Giberne’s album which is undated. Miss Giberne simply stated that it was of the Rev Satthianadhan, his wife and son. She added that his wife, Anna, was the daughter of the Rev John Devasagayam commonly called “Mr John”. 1. The Rev W T Satthianadhan (1830-1892) pastored the Zion church for 30 years, followed by his son-in-law the Rev W D Clarke, and then his grandson, the Rev Samuel Thomas Satthianadhan Clarke. This led to three generations of the family serving that church for 81 years up to 1944. The Rev S T S Clarke’s son ministered there in the early 1970s and then from 1974 to 1989 was the Rt Rev Dr Sundar Clarke, Bishop of Madras. Samuel Satthianadhan (1860-1906) became Chair of Logic and Moral Philosophy at Presidency College, Madras. Through Anna Satthianadhan (1832-1890) the family is descended from the first protestant Indian pastor, the Rev S Aaron, who was ordained in December 1733 by the Lutheran missionary Bartholomaeus Ziegenbalg. Most of this information is from S Mutthiah’s Madras Miscellany 2002. 2. CMS Register of Missionaries and Native Clergy 1804-1904. In 1884 Satthianadhan was elected Fellow of University of Madras and in 1885 received a Bachelor of Divinity degree from the Archbishop of Canterbury. 3. Throughout this post there are references to and information from newspaper cuttings and letters kept by Caroline C Giberne in her Album, which is in the Special Collection at the Cadbury Research Library at the University of Birmingham. The sketch of Anna at 11-years-old and the photograph of her with her husband and a son are from that album, and the rights belong to the Cadbury Research Library Special Collection. 7. Eunice de Souza The Satthianadhan Family Album, Sahitya Akademi, New Delhi, 2005, p85. 8. India’s Women, CMS 1886, pp 241-4, at the Cadbury Research Library Special Collection, University of Birmingham. 13. Mrs H B Griggs memoir (p xviii) in the 1894 edition of Kamala by Krupabai Satthianadhan, published by Srinivasa, Varadachari & Co, Madras. 16. Kamala, pp80 and 119. 20. In her memory the Krupabai Satthianadhan Medical Scholarship was set up at Madras Medical College, plus a memorial medal at the University of Madras for the best female Matriculation candidate in English. 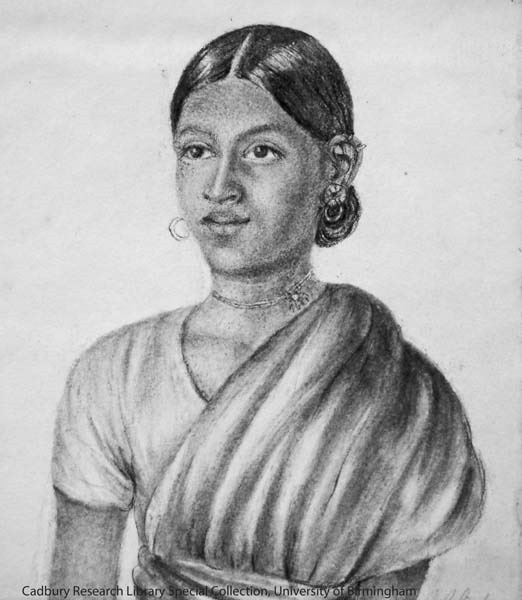 Krupabai Satthianadhan was born in 1862, the 13th child of Haripunt and Radhabai Khisty.